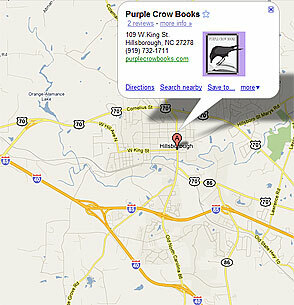 Purple Crow Books is located at 109 W King Street in downtown historic Hillsborough NC. Sharon Wheeler and her staff are always ready with a welcoming smile and great suggestions for books to read. Purple Crow Books regularly holds book readings and book signings at their store. Look on our Events page for details. Several people asked why I chose the name. Purple is associated with both nobility and spirituality. The crow is a symbol for strength for the turn in the road, and signifying an advent of change. I’m very excited about opening this neighborhood bookstore in the lovely historic town of Hillsborough. Because I feel compelled to do this and it is a new road I am walking, the purple crow seems a most appropriate name.